Researchers at the CONICET participate in a training programme for army and civilian personnel from different areas of the northeast Argentina. Course on control over vector insects. Photo: courtesy researcher. Some diseases seem to have been eradicated when they are not mentioned for a long time, and for this reason they are called “neglected”. Nevertheless, they are present and in the Argentine north region the inhabitants are likely to contract them, especially when temperatures begin to rise. These diseases are transmitted by vector insects, which can harm human health. These insects have a special characteristic: inside their organism they can maintain a microorganism, a causative agent of diseases, which are usually viruses and parasites and are not transported mechanically, as if they were a bag, because they live inside them. In general, when these vector insects bite a person, they transmit the disease through contact with its blood as they are hematophagous, i.e. they feed on blood. As part of its Strategic Programme, the Argentine Ministry of Defence, with the collaboration of the CONICET, provides training for army personnel of different provinces in order to prevent the transmission of diseases and control vector insect’s populations. This initiative promoted two special trainings in the cities of Posadas, province of Misiones and Tartagal, in Salta. Specialists at the Centro de Investigaciones de Plagas e Insecticidas (CIPEIN-CONICET) [Research Centre for Plagues and Insecticides] were in charge of the training that had the support of town councils and the Local Government Programmes of the Technology Transfer Office of the Council, which articulated the work with the different parts that were involved. There was also training for diagnosis and treatment of diseases transmitted by vector insects, provided by the Zoonosis Group of the Hospital Muñiz under the direction of Dr. Alfredo Seijo. “Military staff covers a vast territory, they reach remote areas on river banks, in border areas were it is important to have entomological diagnosis in order to know if the vector is present. In order to improve prevention, it is vital for us to have the potential possibility of reaching small municipalities that do not have staff trained to control vector insects’ populations” explains Eduardo Zerba, senior researcher (R), director of the CIPEIN, and one of leading experts on the subject. Zerba affirms that in Argentina there are four vector insects that transmit diseases: Triatoma infestans, also called kissing bug or ’vinchuca’ in Argentina, which is the vector of the Chagas disease; the Aedes, which transmits dengue and chicunyuga; phlebotominae, a species smaller than the mosquito and that transmits leishmaniasis; and the mosquito that belongs to the Anopheles genre that transmits the most important worldwide disease for the World Health Organization (WHO), malaria or paludismo, which paradoxically is less important in our country. 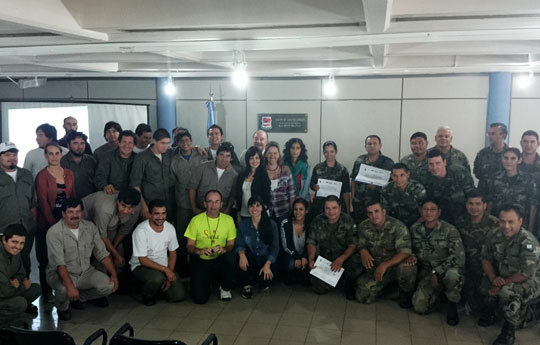 After successful experiences and with the training programme in different parts of the country – the next destination is the city of Santiago del Estero–, the organizers argued that the training provided by the CIPEIN specialists for military staff would also be very good and profitable for the civil society. For this reason, the initiative had the collaboration of the National Ministry of Health. Zerba mentioned one example of collaboration between the ministries: the participation of military staff in the collection of population index of the mosquito that transmits dengue that will later be used for the “mapeo” [the production of a map or elements of the same type that have a particular spatial distribution] with the presence of the vector as indicator of health risk. These “mapeos”are very significant to prevent and control vectorial transmission. The CIPEIN has many years of experience and one of its most relevant achievements was to be appointed as Collaborating Centre of the WHO in the area of control on vector insects of Chagas and Dengue. Furthermore, its researchers have developed proprietary formulations to fight vector insects of Chagas and Dengue. The most recent ones are a liquid formation to spray and a smoke generator with proven vector control and commercial sale. Zerba said that the team is currently studying new formulations developed at the CIPEIN to define its use in order to produce a protocol to control phlebotomus vector of leishmaniasis. “This is a new development, and the results of the first exploratory trials are excellent”, the researcher explains. The studies have been submitted to the Congreso de la Sociedad Entomológica Argentina [Entomological Society Congress of Argentina] in the middle of this year. Finally, Zerba highlighted the fact that Argentina is the only country of Latin America that in order to control insects vectors of diseases, uses insecticide formulations developed locally from research and technology transference of the CIPEIN-CONICET. Dra. Laura Juan, assistant researcher, CIPEIN, CONICET- CITEDEF –UNIDEF. Dr. Raúl Alzogaray, independent researcher, CIPEIN, CONICET- CITEDEF–UNIDEF. Dra. Susana Licastro, CITEDEF researcher. Dra. Laura Harburguer, assistant researcher, CIPEIN, CONICET- CITEDEF –UNIDEF. Tec. Emilia Seccacini, associate professional, CIPEIN, CONICET -CITEDEF–UNIDEF.